The search for a shot of old vinyl has taken this addict to ALL-TONE records in Brixton Market, owned by the great Jamaican singer Alton Ellis. It’s a slightly scruffy record shop specialising in early ska and reggae records. A great place for those that remember stacks of unsorted 45s and L Ps where finding the right sleeve gives you time to listen to the system invariably to be heard from the Glanville Arcade entrance to the market a sprint away from the shop. There is plenty of soul amongst the ska and reggae – discarded and unwanted. Dean Ellis is there, Alton Ellis’ boy and as knowledgeable a person on Jamaican music as you could wish to meet. He knows me of old and here is the chance to sell some of those old soul records from the West Indies that have been forgotten and ignored by the reggae collectors. He puts on this record that he’s been waiting for me to hear. The record is not perfect but then Jamaican records from the early sixties are primitive. The rumour that the vinyl sometimes came from re cycled tyres may even be true. There were only three or four studios and everything had to be done in one take. A voice both raw and beautiful comes out of the speakers. Here is a great soul singer. The song is ‘Shelter In The Storm’ and I want to know more. Dean say JACKIE OPEL played with his dad and the Skatalites back in Kingston when ska first hit and that for a few years Opel was a great star but that it didn’t last because he went home to Trinidad and never came to London like many of the early Jamaican singers such as: Laurel Aitken, Wilfred ‘Jackie’ Edwards, Alton Ellis, Owen Gray and Desmond Dekker. I bought an album that day back in the last century ‘The Memorable Jackie Opel’ (WIRL) – a little ska, a little spouge but mainly deep, deep soul and uplifting R &B. It’s right up there for me with the great soul albums. 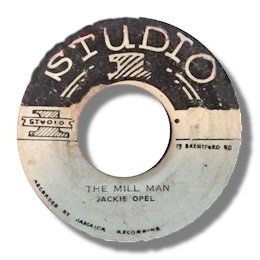 I try to find out more about Jackie Opel in the ever – burgeoning books on Jamaican music. He’s there but only in passing. I want to know more because Jackie has got to me – the voice has got to me as only a great soul singer can. If I want to know more then it’s going to be up to me to search out the truth of Jackie Opel’s musical life. The search becomes a passion. I speak to contemporaries of Jackie Opel and by internet to the West Indies. Slowly the unwritten story, so far, comes to life. Although Jackie Opel is now little known of outside of a passionate band of devotees his extra ordinary talent was much appreciated at the time. He was the composer of 700 known songs, an innovator in musical styles, an arranger who helped create the early ska sound, a sound influenced in part by the Rhythm & Blues of New Orleans and one of the greatest stage performers of the day. 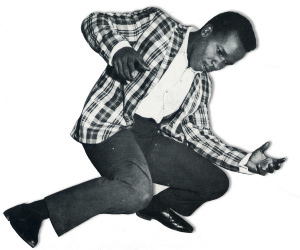 Alton Ellis says to see Jackie Opel was a life affirming event – he was a performer in the style of young Jackie Wilson whose act was a predominate influence. Opel would spin and fall to the ground in a crescendo of legs drooping and flailing arms, a small man in stature but a big man in heart and personality. The music critic Al Gilkes wrote at the time ………. On stage Jackie forced his way into the hearts of his audience to make them share his experience. His tears were their tears, his joy theirs ……..
Jackie Opel was born Dalton Sinclair Bishop sometime in 1938. He was in fact a Bajan by birth from the unkempt Martinsdale area of Bridgetown. Life can not have been easy for Jackie. He came from a large family and money was short. The Barbados where he grew up in the 40’s and 50’s was conservative, racially though harmoniously divided and not yet independent from Britain. There was a middle class elite whose views influenced the music available on the radio stations and in the hotel venues of the islands. The sedate English ways of the elite were in for a musical uprising. Younger Barbadians tuned to USA stations especially WLAC out of Nashville to hear the newer sounds of Rhythm and Blues – not that poorer families could afford a ‘record playback system’. In 1950 such a system cost a year’s average salary. Families made their own music. It was the main source of entertainment. The islands had a thriving indigenous folk music of which calypso from Trinidad and mento from Jamaica were the best known away from the islands. The major hotels in Barbados and elsewhere would hire big bands to play USA swing, big band jazz and later sanitised R&B. Jackie Opel was musical from an early age. He would earn pennies from his singing by swimming out to the liners that docked in Bridgetown Harbour and performing to the passengers. He got the nickname ’Man face’ on account he looked older than he was although physically Opel was small. It was the major hotels where Jackie Opel learnt to perform on stage and where the visiting Byron Lee, the band master of the Dragonaires spotted him. Lee realised that Opel’s six octave voice was a rare gift and he had plans for Jackie to front the Dragonaires. Around 1960 and already married to a Trinidadian (Opel later took Trinidadian citizenship) Jackie left his home island with Byron Lee and The Dragonaires for Jamaica. The union quickly dissolved and there appears to be no records to suggest they made it together to a recording studio. Jackie had other designs in Jamaica , the advent of ‘Dancehall’ which were basically travelling sound systems were bringing American R&B to the mass of the population and Jamaican music , free from the colonial shackles of the fifties was about to take a radical shift. Jackie Opel would be at the forefront of the changes. In 1959 the first recognisable ska records began to appear (some books say ‘Oh Carolina’ by The Foulkes Brothers was the first but this appeared in 1961). As independence in 1962 approached Jamaican music remained the province of R&B and other forms of American music but a musical revolution was nigh in the form of ska, a style of music that quickly gained pre eminence amongst Jamaican youth. The mainstreaming of Ska had a lot to do with Edward Seaga , the newly appointed Minister of Culture and subsequently Prime Minister. Seaga was the owner of Federal Studios, later the owner of WIRL records with whom Opel cut his last records. Choosing to promote Jamaican musical expression Seaga actively supported Ska music. The muti talented Jackie Opel was more than ready to take advantage of the changes. Jackie Opel is now chiefly remembered for the early recordings he made with one of the most celebrated band in Jamaican history. The Skatalites were formed in 1964. An acoustic band of trained musicians Jackie Opel travelled with the Skatellites as one of their lead singers, playing the bass on the occasions when the regular bass player Lloyd Brevett was missing. The Skatalites trumpet player ‘Dizzy’ Johnny Moore called Jackie Opel ‘a genius, the best lead singer the Skatalites ever had’. The standard of the Skatalites records is exceptionally high. Jackie Opel and another member the late saxophonist Roland Alphonso were responsible for many of the arrangements. In view of their huge influence on subsequent developments in Jamaican music it is a surprise to realise that the original Skatalites were together barely two years. 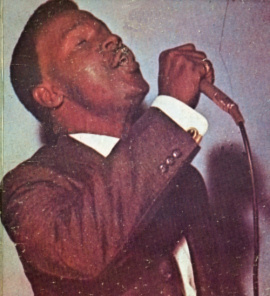 During the period 1963 to 1966 Jackie Opel recorded as a solo artist in a variety of styles including:ska, R&B, soul even gospel (for the Tabernacle label) and calypso. He recorded for Clement ‘Coxsone’ Dodd's Studio One labels, now his best known work much of which found its way to England where it appeared on a number of small independent labels. He also recorded for another seminal Jamaican label Top Deck owned by the late Justin Yap . 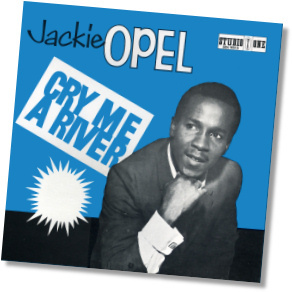 Opel’s style during this period remained heavily influenced by R&B/Soul and songs such as 'Cry Me A River’ (not the late Julie London standard), 'Eternal Love’, the epic 'Wipe These Tears', the intense 'One More Chance' and 'Shelter The Storm’ are about as deep as soul can get. The ska scorchers ‘I Am What I Am’ and ‘King Liges’ were recorded at this time and Opel became one of the hottest singers of the day. He was paired with Alton’s sister Hortense Ellis for the Crescent City sounding ‘Stand by Me’ and with Doreen Schaffer for ‘The Vow’. He appears as backing support for Larry Marshall’s successful cover of Paul Martin’s ‘Snake in The Grass’. The excellence and exuberance of these records is a joy to the aural senses. The use of the Mighty Vikings band after the break up of the Skatalites is scarcely noticed. Opel’s influence during these years was huge with many covering his songs including his protégées The Deacons and the embryonic Wailers who were hanging out with Opel at this time. The sexually charged ‘Mill Man’ from late 64 is one of Opel’s finest vocal performances and features Peter Tosh and Bunny Wailer on backing vocals with a sublime musical arrangement featuring the Skatalites. These were years of huge productivity for Jackie Opel. His output was prolific and maybe fifty Jamaican 45s have been identified. At least fifteen 45s came out on a variety of British labels and at least one USA release ‘Cry No More’ on MGM. In late 1966 a slower rhythm called Rocksteady began to gain acceptance. 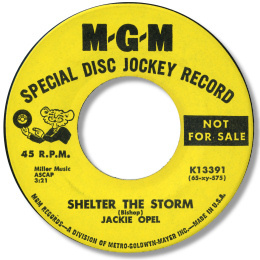 Jackie Opel’s soul orientated style of singing should have suited the new rhythm but only one 45 ’Rosanna’ on Leslie Kong ’s Beverley label is known to exist by Opel in this new style. Jackie, now a huge star in Jamaica, had left Kingston for Trinidad and eventually home to Barbados. I really haven’t been able to find out why. Several sources mentioned his sudden Jamaican farewell to be the result of a death threat from a Yardie gangster in response to an indiscretion with a Yardie girlfriend. Since this story has the provenance of two sources it may have credence but other factors are likely. Opel had a casual approach to his work, his talent being such that he could turn up at a studio and write songs on demand, seemingly with little preparation. He could also sing anything, in any key and with perfect timing. You have to suppose that living on the edge would take its toll. Maybe it did though I don’t have a great deal of evidence that this was the case. Al Gilkes writing at the time of his death refers to …. The pain that life continually bought him … so maybe there were other reasons for his exodus from Jamaica. Opel continued to work and record in the West Indies for the next three years. He remained at his peak and backed by Sid Jones and The Gay Troubadours he went on to record classic records such as ‘You’re No Good’ ’Every Word I Say Is True’ and an epic version of Jackie Wilson’s ’Lonely Teardrops’. Opel continued to experiment inventing the highly popular ’spougebeat’ a derivative of American R&B. Opel’s spougebeat recordings of ‘Higher & Higher’ and ‘You’re No Good’ are just so exciting and vibrant, a lasting legacy to a great innovator of popular music. In conservative Barbados Jackie Opel must have cut a strange and eccentric figure. One anecdote has Jackie in the habit of early morning bike rides still in his pyjamas. There are hints that his mental state was not strong and of dark forces driving him on. Maybe out of respect it’s not right to enquire further as on March 8th 1970 Jackie Opel, a non driver was killed in a car accident in Bridgetown. He was thirty two. His death was a cause of an outbreak of national grief and accolades came in from other parts of the Caribbean, from the USA and from England. The funeral was impressive for a poor boy from Bridgetown: the Troubadours were there dressed in their stage costumes. Other performers were there mingling with many uninvited ordinary bajans who mourned one of their own. ‘Man face’ was home for good. A fine send off but the grave bore no headstone for many years. The subsequent years have not been kind to the memory of this great, great singer. He is only a footnote in the history of Jamaican music. 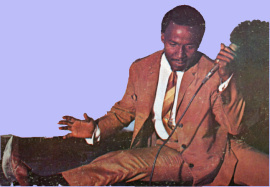 Maybe his Barbadian origins are held against him: perhaps his music being non-political failed to address the aspirations of the people and maybe his music sounded too American when Jamaican patterns of speech have dominated the music but Jackie Opel deserves wider recognition. I leave the final words to a contemporary who wrote on Opel’s death. Postscript: Belatedly Jackie Opel has at last gained official recognition in his home island with the Government sanctioned Jackie Opel Amphitheatre. It was opened by his brother and grandson. Note: ‘You Gotta Cry’ is in fact ‘Cry Me A River’ renamed to avoid confusion with the Julie London standard. Note: Coxsone Dodd has recently issued a US Studio One CD entitled "Cry Me A River" which features many of Jackie's greatest soul cuts. Note ~ Special thanks to Ryan & Sara from Murcia in Spain for the excellent Mill Man picture.